Hampshire chairman Rod Bransgrove says the decision not to allow the club to stage an Ashes Test in 2019 may force him to rethink his role. The England and Wales Cricket Board has opted to add Edgbaston and Old Trafford to the list of Ashes venues for 2019. The Ageas Bowl remains the only Test ground in England yet to stage an Ashes match against Australia. "I need to decide whether I hang in for another round and see if we can get one next time," said Bransgrove. The ground, opened in 2001, has undergone a major transformation over the past few years and the work is due to be completed in April next year. The £38.5m revamp includes the construction of a four-star hotel, conferencing and hospitality facilities as well as a new media centre. Bransgrove told BBC Radio Solent he had previously been contemplating taking more of a "back seat" if they had been awarded an Ashes Test for 2019. "I'd really hoped my work would be done here next summer," he had said. "With the completion of the hotel, with us returning to a profitable performance and hopefully with an Ashes Test for us to look forward to, I really felt there was little more I could bring to the business in the future. So I was contemplating then getting right onto the back seat." In September 2013, former England captain Michael Vaughan described the ground as an "incredible venue". However, the only Tests so far staged there were against Sri Lanka in 2011 and India earlier this year. On Wednesday, Edgbaston and Old Trafford were added to Headingley, Lord's and The Oval for the 2019 Ashes series by the England and Wales Cricket Board. 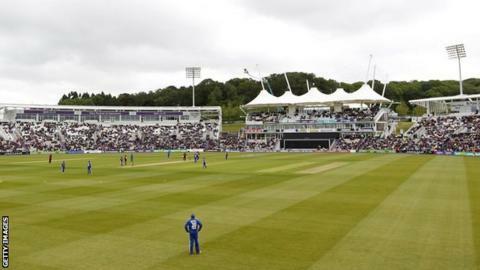 However, the Ageas Bowl was awarded a Test match against India in 2018, as well as other limited-over games in 2017 and 2019, fixtures described as "spectacular" by Bransgrove. "On the one hand we cannot pretend we are not disappointed that we have been overlooked again in terms of being awarded an Ashes Test match," he said. "We've built what we consider the best cricket-watching venue in the country. On the other hand we have a spectacular collection of international cricket to offer. "We have reason to be satisfied but are a little bit disappointed we are not right up there at the top table. There are always people who win and people who lose and we are somewhere in the middle."